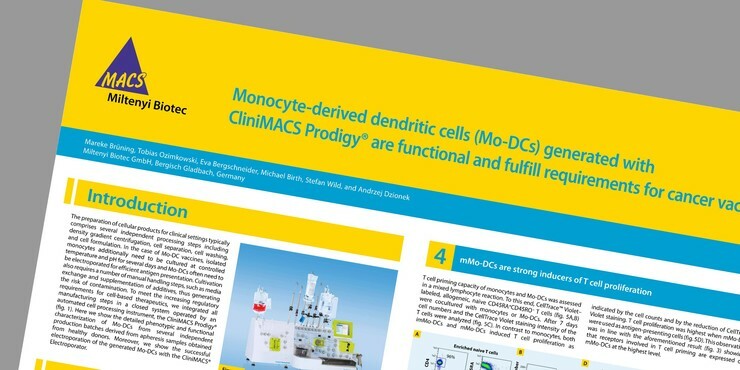 Discover our different workflows for monocytes and Mo-DCs and find the one that fits your experimental needs. Increasing number of studies focus on the distinct functions of classical an non-classical monocyte subsets. We have developed specific kits for the separation of monocytes and monocyte subsets. Flow cytometry analysis of CD14+ cells isolated from PBMCs. CD14 MicroBeads enable the isolation of viable CD14+ monocytes to high purities, with high yields. The isolated monocytes are suited for subsequent differentiation into Mo-DCs. Isolation of CD14+ monocytes. 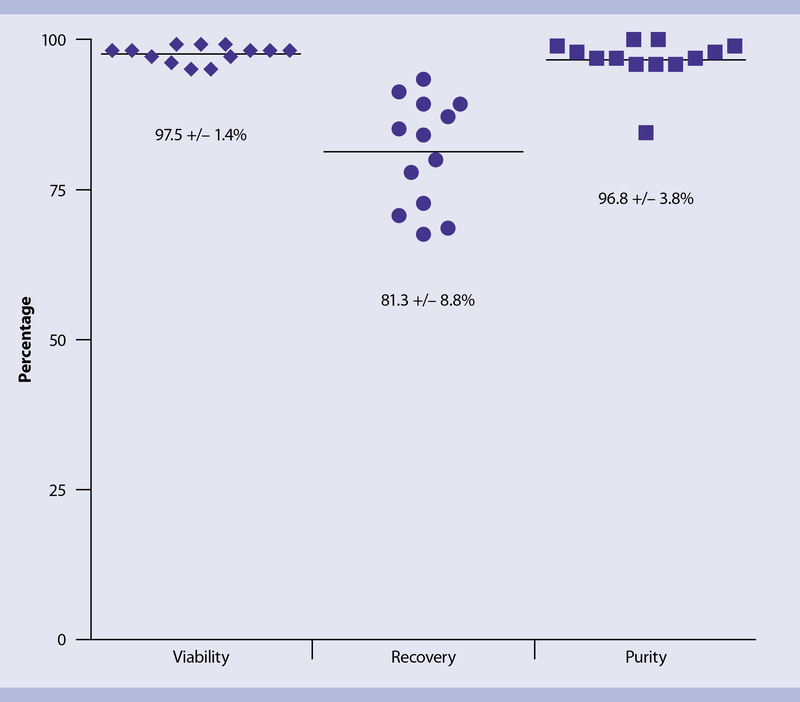 Purity, recovery (i.e.,percentage of CD14+ cells in the purified fraction in relation to theoriginal fraction), and viability of enriched CD14+ cells are shown.Cells were labeled with a CD14-FITC antibody and analyzed byflow cytometry. Using our new StraightFrom™ Portfolio we provide tools for fast and easy isolation of monocytes directly from whole blood, buffy coat, and leukapheresis without the need for density gradient centrifugation, wash steps, erythrocyte lysis, and cell counting. Using StraightFrom™ Buffy Coat CD14 MicroBead Kit, human you can get pure CD14+ monocytes directly from buffy coat in less than 30 minutes. Isolation of CD14+ monocytes from buffy coat. Separation of a buffy coat sample using the StraightFrom™ Buffy Coat CD14 MicroBead Kit and the MultiMACS™ Cell24 Separator Plus with the Single-Column Adapter and Whole Blood Columns. Cells were fluorescently stained with CD15-APC, CD14-PE, as well as CD45‑VioBlue® and analyzed by flow cytometry using the MACSQuant® Analyzer. Cells were triggered via CD45-VioBlue, cell debris and dead cells were excluded from the analysis based on scatter signals and propidium iodide fluorescence. Large numbers of DCs for basic research and immunotherapies can be generated in vitro from monocytes using several differentiation/maturation protocols. To obtain functional Mo-DCs that activate T cells efficiently, reliable procedures using high-quality reagents are necessary.